I have never purported to be a beauty blogger, but when a friend commented the other day that my bathroom was beginning to look less like a bathroom, and more like a branch of Boots, it occurred to me that I might have something of interest to say on beauty and cosmetic products. Not because I know anything at all about them, but because I tend to buy a fair amount of them, and I’d like to start including on here some reviews of what’s good, and what’s not. 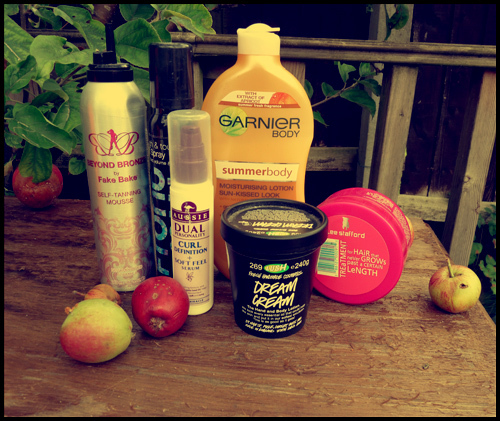 Because it is still five days (yes, I’m counting) until payday, and so I haven’t bought anything new over the last few days, I thought it would be good to start off by telling you about some of my bathroom staples – the products I go back to buying again and again. Beyond Bronze – Fake Bake. I have probably tried most of the fake tans out there that retail at under around £20. I picked this up in Boots when there was an offer on and it’s the best one I’ve tried; doesn’t come out patchy and gives a really nice colour. £12.99 and free shipping at Click Fragrance. Do you use any of these products? If not, what’s the product you always go back to?